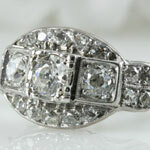 Estate, vintage and antique platinum jewelry. 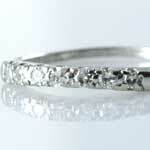 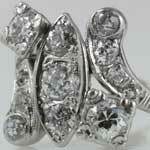 Seven bright diamonds shine in this estate 1940s diamond wedding band in platinum. 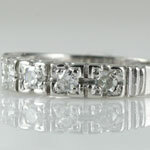 Splendid 1940s estate platinum wedding band with date inscription. 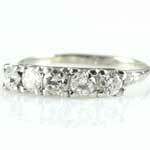 Exquisite antique five old diamond wedding band in platinum (0.65ctw, VS1 - VS2, G -J). 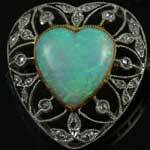 Antique Edwardian heart shaped opal diamond brooch in platinum. 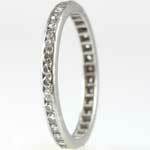 Eight fiery diamonds glisten in this antique platinum wedding band (1/4 ct tw, SI1-2, I-J). 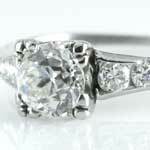 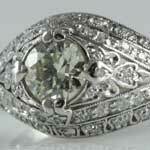 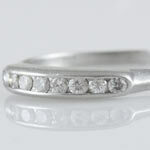 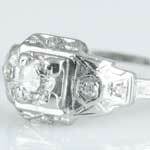 Pretty dainty ladies antique 1920s diamond platinum wedding ring (0.32ct tw). 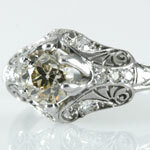 Majestic antique wedding ring featuring an old cut diamond adorned by six smaller diamonds in platinum (1.15 ct tw, G-H, Vs1-VS2).